Periodontal disease may sound like a cause for alarm for most patients, but it is treatable. The disease is caused by a bacterial infection. Dentists and periodontists can work cooperatively to manage the infection using periodontal scaling and root planing. 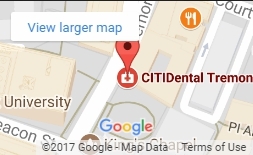 CITIDental Tremont offers Boston patients with scaling and root planing procedures, which involves professional removal of tartar, the main cause of periodontal disease. Tartar is created when plaque hardens and hosts harmful bacteria. It cannot be removed with conventional cleaning techniques such as brushing or flossing. During scaling, special instruments will be used to remove the tartar from the teeth. Root planing allows the tooth root to be smoothed to prevent additional tartar from accumulating. A topical or oral antibiotic can be administered to eliminate remaining bacteria and prevent future infection. To maintain good health, you should follow a healthy diet and avoid using tobacco products. Patients with advanced gum disease or bone loss can opt for alternative treatments such as grafting. For additional information on treating advanced periodontal disease or to schedule an appointment for scaling and root planing, please call CITIDental Tremont today.